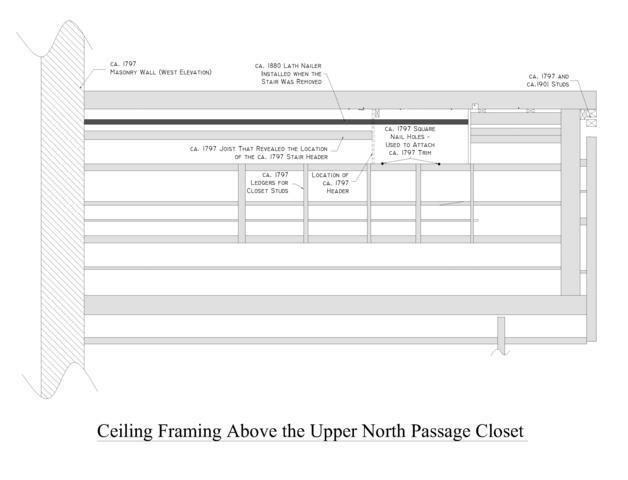 When it was discovered that the garret hatch in the Upper South Passage closet had been blocked by shelving in either ca. 1797 or ca. 1812, the Restoration Team knew that the Madisons would have needed a new way to access the garret. While there were full-sized garret stairs built in the 18th century (such as the garret stair at Mount Vernon), it was more common for the garret stair to be found in a closet or small stair room. Because there was only one closet on the second floor of the ca. 1797 addition, that room was the most likely location for the new garret stairs. These suspicions were confirmed when the ca. 1901 flooring was removed from the garret and the original Madison framing was exposed. Evidence found on the framing revealed that a hatch had been built in ca. 1797 to access the garret. While one end of the hatch framing (called a header) had been removed in ca. 1880, nail holes and portions of the ca. 1797 framing revealed the size of the hatch and indicated how it was trimmed. Evidence for the garret stair hatch found on ca. 1797 framing.